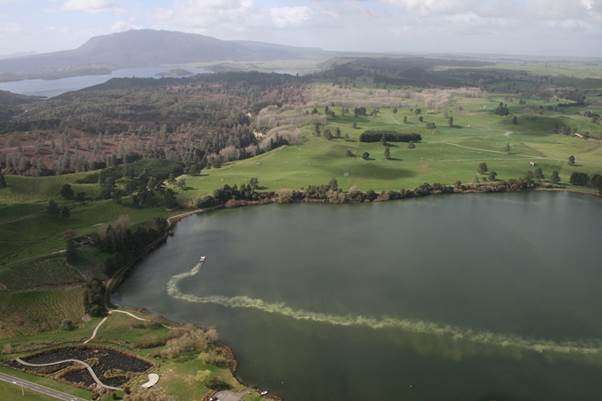 Geo-engineering applications of a modified zeolite product called "Aqual-P" at Lake Ōkaro, New Zealand. Image courtesy of Andy Bruere, Bay of Plenty Regional Council, New Zealand. Phosphorus is the biggest cause of water quality degradation worldwide, causing 'dead zones', toxic algal blooms, a loss of biodiversity and increased health risks for the plants, animals and humans that come in contact with polluted waters. This threatens the loss of economic and social benefits from freshwaters upon which society relies. In a series of studies published in a special issue of Water Research, leading scientists assess how geo-engineering in lakes can control phosphorus pollution. After decades of run-off from agriculture, human sewage and industrial practices, phosphorus has been stock piled at an alarming rate in our lake bed sediments. The scale of the problem is daunting, and humans are still pumping about 10 million tonnes of extra phosphorus into our freshwaters every year. Long-term monitoring activities following the control of phosphorus sources to lakes show that plants and animals don't recover for many years. This is because phosphorus stored in bed sediments is released back to the water column. Society then has to make a decision – either speed up recovery using geo-engineering to cap sediment phosphorus stores, or do nothing, and accept poor quality freshwaters for decades to come. Geo-engineering is contentious, costly, and the side effects are not well known. This special issue brings together 60 authors from 12 countries to present evidence on this approach. Miquel Lürling, lead author and guest editor, Freshwater Ecologist, University of Wageningen, the Netherlands, explains that "The scale of this problem has driven the development of a vibrant green economy sector. Our special issue uncovered an alarming number of emerging materials being proposed for use in lakes. The potential for unintended side effects when using novel untested materials is high. A common conclusion of a number of papers was that it is essential to conduct comprehensive assessments of candidate lakes prior to any treatments. We reviewed these considerations in our editorial paper and stress the need to ensure the safe and effective use of this approach." With the recent introduction of water quality targets and deadlines for standing waters including the EU Water Framework Directive and the Clean Water Act in the USA, the need for approaches like geo-engineering is growing. About 40% of lakes in Europe are failing current water quality targets and combined economic losses in the USA associated with high phosphorus levels in freshwaters is estimated at $2.2 billion annually. There is a need to develop approaches that effectively control phosphorus pollution in freshwaters. This special issue draws on a wide range of laboratory and field scale experiments to produce the most comprehensive analysis of this approach for phosphorus management to date. Bryan Spears, lead author and guest editor, Freshwater Ecologist, Centre for Ecology & Hydrology, UK, commented: "Our papers assessed the ecological and chemical responses across over 100 lake treatments from around the world. It's safe to say the approach is widespread and global. Most case studies used either aluminum salts or lanthanum modified bentonite additions to control phosphorus. The responses were highly variable across the lakes. In some cases dramatic and sudden improvements were reported in chemical and ecological quality, in others nothing really happened, or the responses were short lived. To improve confidence in the use of the approach a series of papers presented models to predict responses in candidate lakes. One key conclusion is that although this mitigation approach is promising when used correctly and in combination with catchment management, it should not simply be used to off-set the effects of poor environmental behavior." Geo-engineering in lakes is also being targeted at other environmental problems. Emerging approaches include the control of greenhouse gas emissions from lakes and the control of toxic cyanobacteria for human health. For example, geo-engineering approaches were utilized in the 2012 London Olympic Games, the 2014 Glasgow Commonwealth Games, and have been proposed for use in the upcoming 2016 Rio Olympic Games to ensure acceptable levels of health risk to athletes during open water events.